Google Earth and Google Maps Have Tiny Market share, Is it all media Hype? I spotted this article on ZDNet recently, looking at how successful or not the different google vertical markets have been. 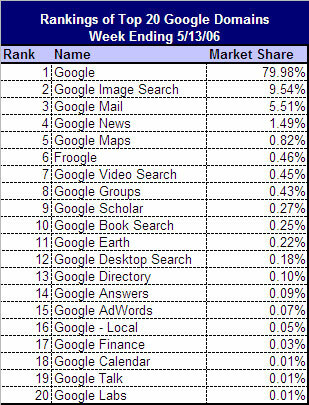 The table they present seems to show that Google earth has 0.22% of market share and that Google maps has 0.82% of market share. I presume the figures are actually based on share of the google brand not share of the individual markets such as online maps or interactive 3D globe viewers (Is this a market in its own right now….) which is what the article implies. its not easy to tell what the table is based on, but if search trends are anything to go by its not looking too bad for Google earth at least, in maps they are still behind mapquest. So is it all media/blog/industry hype or have google earth and google maps really stormed the market, or created a new ones? Most "normal" people i know have seen or heard of google maps but not many have ever heard of ESRI, so if they were in the market for a 3D visualisation tool I'm pretty sure i know where they would end up. There’s a big difference between ESRI and all of the other map software out there. The difference is that ESRI software is true GIS mapping software for the GIS professional. To the person who knows how to use it, ESRI software can out do any of the other mentioned applications a hundred times over. Where Google Earth can tell me where my house is, ArcGIS can do complex spatial querries and geoprocessing. There is no comparision. ESRI is in a different category all together. They are not in direct competition with each other. Mike, you are 100% correct there, however I think we can still learn something from these applications, particularly about making user interfaces more accessible to new or “naive” users. Its all very well having all the functionality that we have in our software, but it needs to be accessible to all users not just “GIS Professionals”. This is one of the reasons I’m so excited about ArcGIS Explorer, as it should allow Complex (Should that be “Advanced”?) geoprocessing functions to be made available to a much wider user base through a new UI paradigm.